Let's cut straight to the chase here. Beauty and the Beast is a solidly mediocre show with some really awesome qualities (passes the Bechdel Test, passes the Race Test, has female character of color lead, etc) and some less awesome tendencies (whole show is basically a domestic abuse narrative, which is less than stellar). It's one of those things where I like it, but if it got cancelled, I'm hard pressed to say that I'd notice very quickly. Still, it is a television show and it is precisely in the sweet spot of things that we like to talk about here on Kiss My Wonder Woman, so let's go. 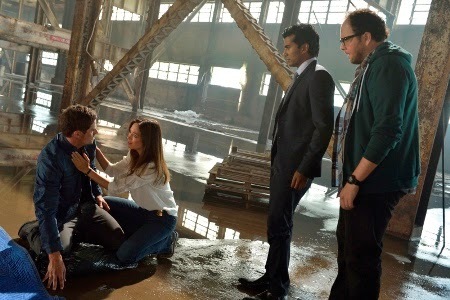 As you might recall from the first season, the show follows Cat (Kristin Kreuk), a distressingly attractive police detective who works out of the most stylish police station in the world. Cat and her designer wardrobe, apartment, and skincare regimen are shocked when one day they discover a missing person. Or rather, a person thought dead, named Vincent Keller, who once saved her life. 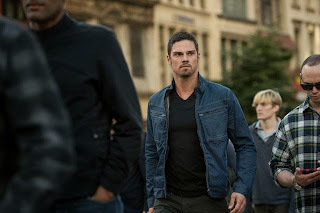 Vincent (Jay Ryan) isn't just some ordinary stalker with deep-seated emotional problems. He's a "Beast", a government created super-soldier with some serious rage issues and a "beast-mode" where he murders everything. Naturally he and Cat fall in love. Of course, this does not sit well with anyone with half a brain, such as JT (Austin Basis), Vincent's best friend, or Tess (Nina Lisandrello), Cat's partner and also her best friend as well. JT and Tess reasonably understand that for various reasons, like how Vincent is being hunted down by the rogue military operation that created him, and also how he's an uncontrollable rage monster, the relationship will never work. But our crazy kids try anyway! Unfortunately for them, and this is still all last season, by the way, Cat's new friend Gabe (Sendhil Ramamurthy) gets in the way. It seems that for plot related reasons, Gabe is also a "beast" and needs to use Vincent in order to be cured. Which is precisely what happens in the season finale. Gabe is cured and Vincent is taken away by Muirfield, the evil people who tried to kill him. Oh, and we find out that Cat's father is not actually her father, right after he gets shot. So! 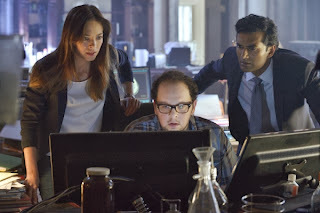 Starting in at the beginning of the second season, we find that three months have passed, and in that time Cat has gone pretty much insane looking for Vincent, while both JT and Tess tell her to cool it off. She's been blowing off every attempt from her sister to talk, because her sister desperately needs to tell her the truth about their father, and she's been dodging out on work that it seems the big mystery that police department should be solving is how the hell they haven't fired her yet. I'm serious. Cat is terrible at her job. But just as things seem totally hopeless, and it looks like Cat is going to be forced into being a productive member of society again, Gabe comes through for them. He found Vincent. Sort of. It looks like Vincent, but he's missing a scar, and he has a much better haircut, he seems to be some kind of assassin, and oh yeah, he doesn't remember any of them. Like that's going to stop Cat from careening across the city to save him! She zooms onto the scene, where Vincent has been taken prisoner by a mad scientist of some sort (apparently the guy who made him). She thinks she's there to save her boyfriend, but in reality, she saves the scientist, whom Vincent was about to kill. Huh. That can't be good. And it isn't. Vincent is baffled and confused about why these weird people take him away with them, and Cat can't seem to get it through her head that he remembers absolutely nothing about them. Also that he is momentarily evil. They tell him part of the truth. That JT is his friend, that Cat is his epic love interest, and that they've been looking for him since he disappeared three months ago. And Vincent buys it, at least enough to ask his superiors who he was before they got their hooks in him. His superiors seem to be okay with it all, especially when we discover, surprise! The head honcho is Cat's real dad. That doesn't complicate things at all. The rest of the episode follows Cat as she tries to balance Vincent watching with her personal life and fails at both. Vincent kills someone, Cat disappoints her sister, and everyone is sad. But, I guess it's a good thing, Vincent and Cat decide to try again at having a relationship. Right before he goes out and murders a guy. Who says romance is dead? Okay, as I'm sure you've gathered from my tone, I don't love this show. I find it unbearably silly, and not in the way I appreciate. It bothers me that a show like this, which has an epic conspiracy, rather like Dark Angel, actually, and a nice procedural hook with Cat's police work, wastes everything on a romantic plot that does little to enhance the story. Like, seriously, this whole show is devoted to the ins and outs of Cat and Vincent's relationship, and that is not nearly enough to anchor an hour long drama. Not even a little bit. On top of that, all the elements I praised when the show began, like Cat's independence and comparative lack of emotional issues and the diversity and the female characters, have all faded to the background or been erased by the narrative. Where Cat originally was a highly competent police officer investigating a hella sketchy vigilante, now she's a concerned girlfriend with daddy issues running around, screwing up her job and spending all of her time with white male characters. 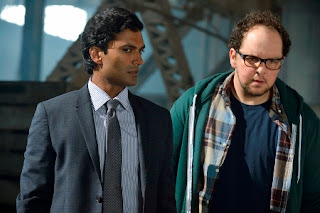 The characters of the color on the show, Tess and Gabe, mostly exist to run interference for Cat at the police station. Heather, her sister, is only there to add drama to Cat's personal life. And Cat herself, who has the potential to be a phenomenal character, has slowly degraded into being a woman of color defined entirely by the white men in her life. She is Vincent's girlfriend, the Muirfield director's daughter, the adopted daughter of a lawyer, JT's friend. She exists only insofar as she relates to white men. Instead of focusing on her relationship with her Asian mother, they focus on her relationships with her white fathers. Instead of finding comfort in her friendship with Tess or her sister, both women of color, she finds all of her emotional support in JT. Instead of focusing on herself and her own life, Cat sacrifices everything for Vincent, a white man who displays such a parody of male power as to be unintentionally funny. Except for the part where it is so deeply sad. For all of its faults, though, Beauty and the Beast is imminently watchable. It's not spectacular television by any means, and I don't think anyone is apt to get confused on that front, but it is entertaining. It's just...yesterday I pointed out that nothing offends me more than willful mediocrity, and it's true. This show has so much potential to be good, and it isn't. Doesn't that bother you? That they aren't even thinking to try? That they decided to include all these awesome elements and ditch them halfway through the first season? That pisses me the hell off. Sure, the show is reasonably enjoyable when you turn your brain off, but I don't want to turn my brain off! I like my brain! It's a good brain! Stop insulting it! Beauty and the Beast. Apparently it's still on the air. And, honestly, that kind of blows.